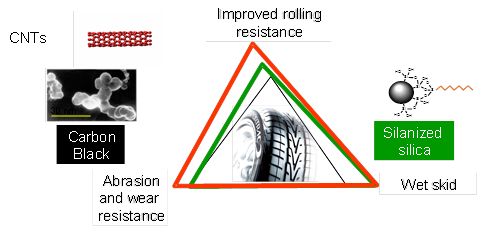 The main objective of WP 2 is to develop advanced truck tyre compounds for the next generation of truck tyres with extremely low rolling resistance and at the same time high wear and fracture-fatigue resistance by combining and exploiting innovative recipes and preparation techniques with silica, carbon black and Multi-Wall Carbon Nano-Tubes (MWCNT). Novel synthesis of raw materials will be applied for tailored CB grades and functionalized elastomers, while best in class available grades will be applied for silicas and MWCNT’s. Dedicated lab testing programs and to a certain extent tyre testing programs will be run to assess the overall benefit and the individual contribution of the new material concepts. Special emphasis will be given to clearly work out the performance benefit of small loadings of MWCNT’s which are optimally dispersed and distributed for achieving a highly effective elastomeric reinforcement at lowest hysteretic contribution. i) Selection and characterization of raw materials. Especially new surface activated carbon blacks and new high structure carbon black will be tested in model recipes. 5. Synthesis of safe dust free handling preparations for CNTs using low molecular polymers or liquids as a matrix. The performance of such preparations will be tested by workplace air measurements by means of active sampling and quantitative analyses. This health and safety aspect is considered by the consortium as a major descisive factor for introduction of CNT`s in large scale production. It has also to be noted that this WP will be strongly related with the other WPs of the conception phase: the WP1 and the WP3. Indeed the findings of the WP3 will be used as input for this WP, while the WP2’s findings will be used as findings.